OXFORD – DaMarkus Lodge is patterning his work ethic after that of Laquon Treadwell, Ole Miss’ standout wide receiver who now plays for the Minnesota Vikings. 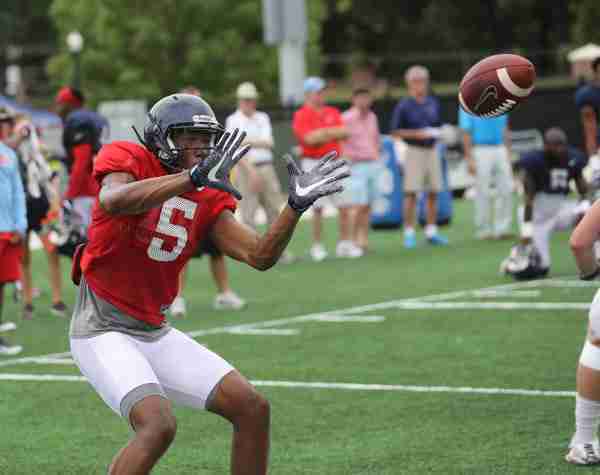 Lodge, like Treadwell before him, tries to find ways to get better and will never settle for less. To do that, the 6-foot-2, 190 pound receiver spends a great deal of time in the film room — right beside senior quarterback Chad Kelly — preparing for Florida State. When Lodge is alone, he tends to spend three hours in the film room concentrating on the Seminoles’ defense, anticipating what he could possibly see on Sept. 5 when No. 11 Ole Miss takes on fourth-ranked FSU inside Camping World Stadium in Orlando, Florida. To understand the Seminoles’ defense better, Lodge joined Kelly in the film room a couple of days ago to prepare for the Rebels’ first test of the 2016 season. FSU’s defense finished the 2015 season ranked 35th in the nation in sacks (32). “I’m just getting ready,” Lodge said Tuesday morning. This season, the Seminoles’ defense will be anchored by senior defensive end Demarcus Walker and sophomore defensive end Josh Sweat. Walker had a solid junior season for FSU, posting single-season career-highs in tackles (58), tackles for losses (15.5), sacks (10.5), pass break-ups (five) and forced fumbles (four). Sweat played in all of the Seminoles’ 13 games (started in nine) last season, posting 41 tackles, five tackles for losses, two sacks, an interception, three pass break-ups, three quarterbacks hurries and three fumble recoveries. 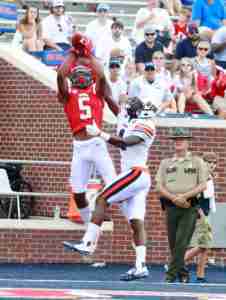 DaMarkus Lodge makes the catch last year against UTM in his freshman season. Outside of the film room, Lodge has taken advantage of every opportunity to ensure he and Kelly will be on the same page whenever the football comes his way. He knows merely having the height, weight and quick feet isn’t enough to help the offense move the chains. But that is what Lodge thought when he first arrived in Oxford as a four-star recruit out of Cedar Hill, Texas. “Coming in highly recruited and having to step down a little bit, it kind of took a toll on me,” Lodge said about his freshman season. Lodge has obviously used his time wisely. I knew that I had to mentally get myself ready, had to grow up and mature. He’s not going to put me out there on the field if he can’t trust me. I knew the only way I would be able to go out and make plays was if I matured and got myself right mentally. Lodge catches 100 footballs a day at practice now. He keeps his nose inside the playbook, taking in the different coverages and plays to get a feel for Division I collegiate football. He learned that just catching 100 footballs is not enough to become an elite wide receiver. It all starts in the film room. You have to go in the film room and watch film for hours. You have to learn coverages, learn defenses, learn what defenders want to do, how they play. Lodge and the Rebels take on Florida State at 7:00 p.m. (CT) in Orlando on September 5. The game will be televised by ESPN.